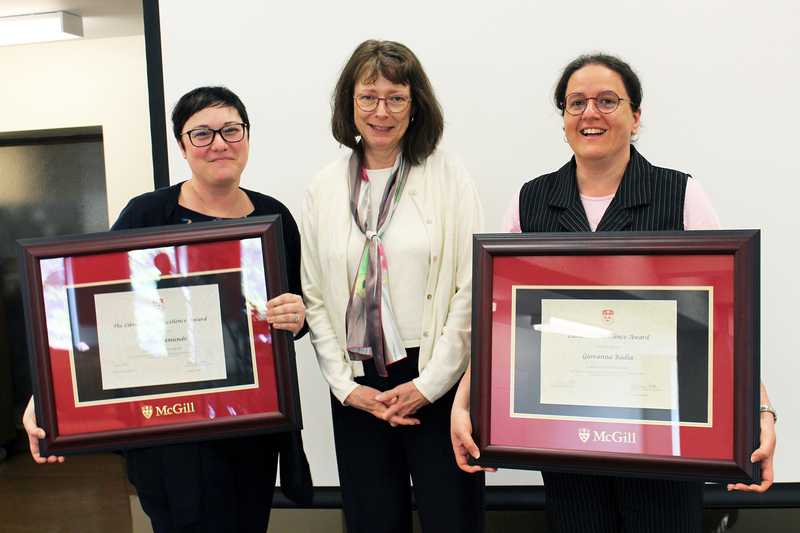 Congrats to the recipients of the 2018 McGill Library Excellence Awards! The awards recognize outstanding contributions to the Library and its mandate. Liaison Librarian, Giovanna Badia received the Librarian Excellence Award and Communications Officer, Merika Ramundo was awarded the Library Staff Excellence Award. Giovanna is an exemplary librarian and has made a significant contribution both to the McGill University Library and to the profession as a whole. Where Giovanna has perhaps demonstrated the most impact is through her tireless efforts to serve McGill science and engineering departments as Liaison Librarian. She goes above and beyond in the delivery of reference services and information literacy sessions, making herself available and invaluable to students, faculty, and staff. She is continually experimenting and assessing her practices while at the same time sharing lessons learned with other librarians. Giovanna continues to build on her contributions to positive student and faculty outcomes and experiences, as shown in her innovative support for the Department of Mining Engineering in open access publishing. 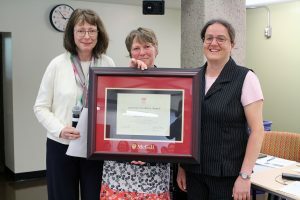 She has also demonstrated excellence in academic librarianship and has won the respect and admiration of her colleagues. Her successful research practices are evident in an impressive publication record, with over thirty works that include peer reviewed articles, conference papers and book chapters, four of which were released in 2017. She continues to explore research methods that require a high skill level and attention to detail, such as her project using citation analysis to identify appropriate databases. Giovanna also has an exemplary service record and has made a significant contribution to the profession through associations. Her expertise is recognized by colleagues internationally, as is shown by her role as 2016 Chair of the Special Libraries Association Engineering Division and her involvement throughout 2017. Her passion, dedication, and innovative spirit shined during her tenure as co-chair of the Library’s Orientation Committee. Under Giovanna’s leadership, the Committee obtained funding to organize the Library’s first ever ice cream social. The event united Library departments and promoted a spirit of connectedness. Its success can be greatly attributed to Giovanna’s fearlessness in testing out inventive ideas and to her strong sense of diplomacy. Committed and selfless, she doesn’t hesitate to give advice and that advice always comes with an offer to help. She’s an excellent team member and significant contributor to the McGill community. In short, Giovanna is generosity. 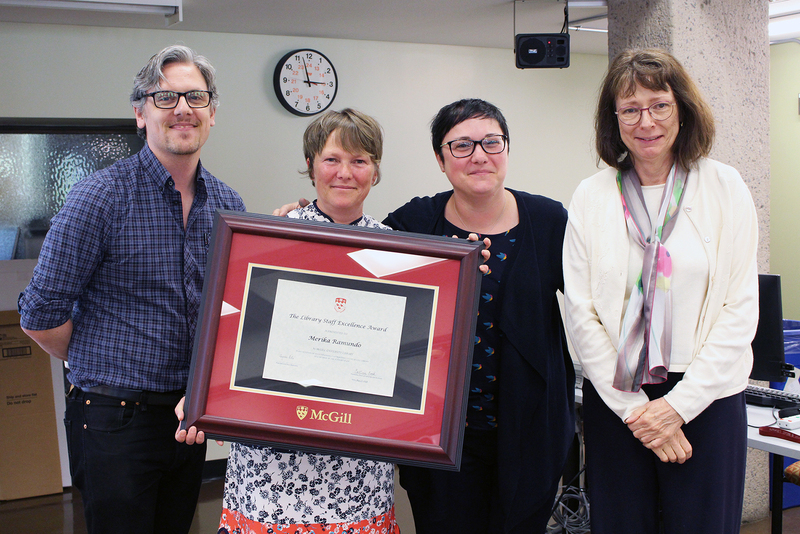 Merika was nominated for this award by colleagues, former students, volunteers, Friends of the Library members and collaborators, in recognition of her boundless creativity, outstanding leadership and tireless efforts to promote the McGill Library. Above and beyond her daily projects, Merika’s collaborative, pro-active approach is illustrated by several recent initiatives. She successfully launched two Library Innovation Fund initiatives: Enhancing McGill Library’s social media presence and McGill’s Little Free Libraries (LFL), a campus-wide book exchange project. Both projects were very successful and forged close collaborations between the Library and several university-wide units, including McGill Central Communications, the Faculty of Education and the Office of Sustainability. Congrats, Giovanna and Merika! Very well-deserved!